The FRITZ!Box Fon WLAN 7270 is packed with features, including an impressive array of telephony functions. There are two analogue ports for phones or fax machines, an integrated DECT base station supporting up to six cordless phones, and VoIP support. It even has integrated fax and answering machines. 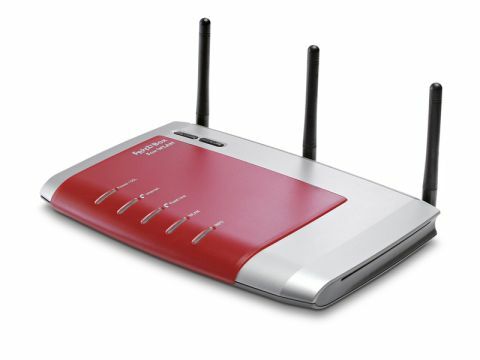 To get you onto the internet, the FRITZ!Box has a built-in ADSL2+ modem, and can work with cable or fibre connections. It supports the 802.11n wireless standard, and you can even plug in a 3G dongle into its integrated USB port and access the net without a landline. Or, connect a USB printer or hard drive to create a network device. In our wireless tests, read/write speeds got as high as a 4.2MB/sec average, and were over 3.5MB/sec. But it's the router's advanced traffic shaping feature that really impressed. By checking pending processes every millisecond, it ensures your surfing or email is never held up by heavy uploads or downloads. Unfortunately, this device lacks the feature Mac users are crying out for. It can't operate on the 2.4GHz and 5GHz wavebands simultaneously. This means if you want to join the network using a wireless g device, you're restricted to a congested 2.4GHz band. Unless you're interested in its telephony functions this might not be the router you're looking for, but there's no doubt that it's an extremely high-quality piece of kit.